As a courier driver you can get courier insurance that protects you in the event of goods being stolen for your vehicle, but have you ever had parcels stolen from customers’ doorsteps? This can happen to anyone that’s had a courier driver deliver packages when no-one was in. Amazon has worked hard to tackle this issue and this is where the Amazon Key service comes in. Do you think customers would let you into their homes when they aren’t there? You’re probably thinking: ‘How is this possible if they’re not home?’ and ‘Is it wise to be letting strangers into homes?’, but thanks to new technology by Amazon, your parcels can be safely delivered and be waiting for customers right inside their homes. 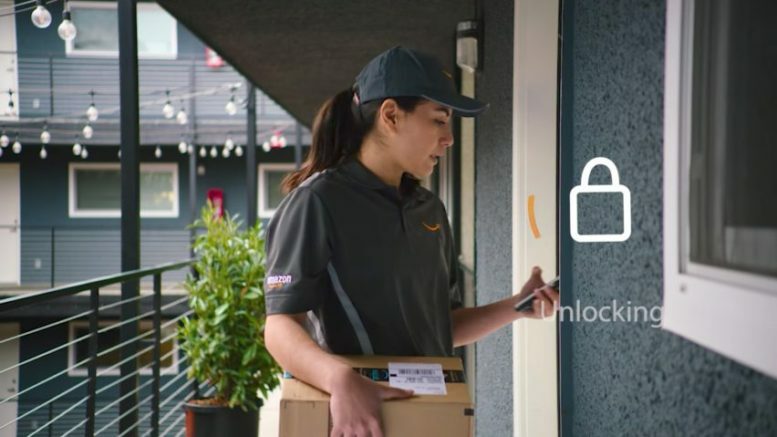 Amazon Key technology is an innovative new service that allows Amazon couriers to open homeowners’ front doors, safely deliver parcels and record the whole process for you and customers. 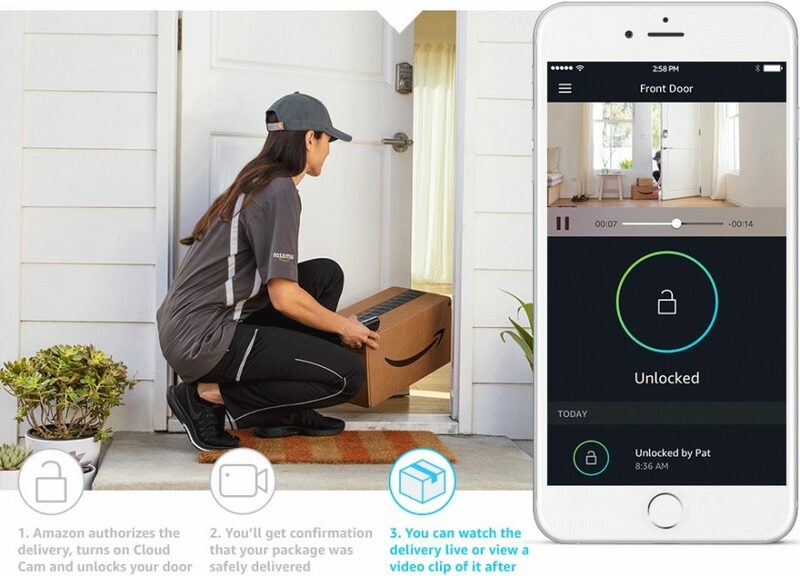 Currently available to Amazon Prime members only, the Amazon Key system works by relying on the Amazon Key app, Amazon’s Cloud Cam (an indoor security camera), and a compatible smart lock for homeowners’ front doors. When a courier driver arrives at customers’ homes with their packages, the Amazon Key service begins when the delivery driver scans the parcel’s barcode, which then sends a request to the Amazon Cloud. Through an authentication process on the Cloud, the delivery driver is verified and Cloud Cam is turned on to record the delivery. The courier driver also gets a prompt using an app on a mobile, which they then swipe. This action enables the camera to wirelessly instruct the smart lock to unlock the door and grant the delivery driver access into the home to drop off the package(s). 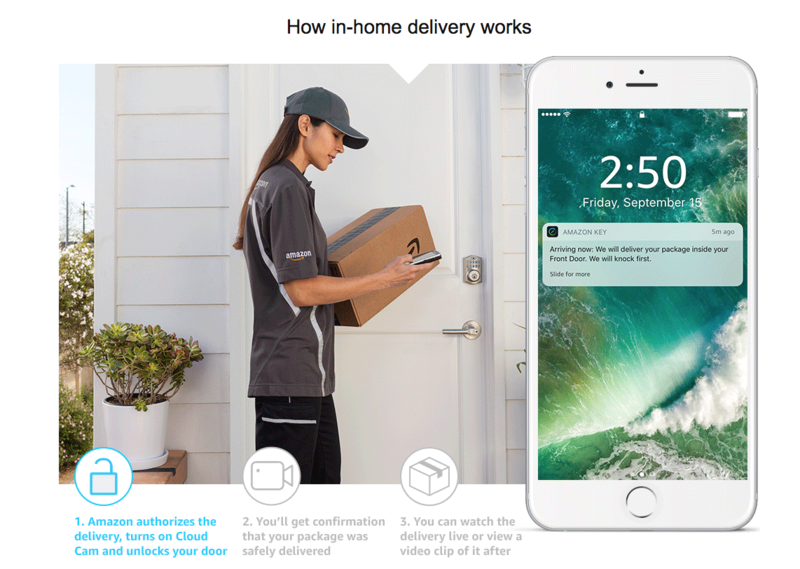 Once the parcels are dropped off and the door is locked again, the customer receives a notification from Amazon, notifying them that the delivery is complete. Customers are also sent a short video (the recording of the delivery) to reassure them that the courier driver carried out the process accordingly. There is also the option of customers watching the whole process live on their smartphones, via the cloud-connected camera. Amazon Key in-home delivery was launched in the USA, November 2017 and it’s only a matter of time before it’s launched in the UK and Europe too. It has proved popular with courier drivers and customers alike, with the exciting additional launches of the Amazon in-car delivery service and the use of drones to drop off packages into customers’ back gardens. Being a relative new process, Amazon is continuing to further improve the service for courier drivers and customers too. The Amazon Key system reassures courier drivers and customers that parcels they drop off have been safely delivered, not only at the correct address, but that they also are not going to go missing or get stolen. Are you a courier driver wanting to protect yourself when delivering packages? Be the first to comment on "How Does Amazon Key Work?"